Edgar Rice Burroughs’ Lord of the Jungle first hit the screen way back in 1918 with Elmo Lincoln as Tarzan. 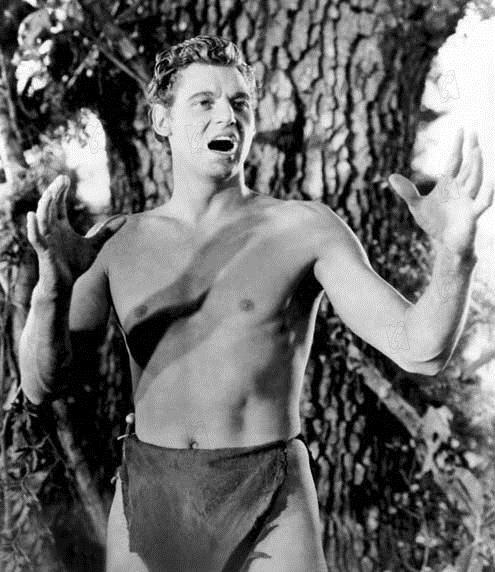 Many actors since then have donned the loin cloth, but for me the definitive movie Tarzan remains Johnny Weissmuller , who swung from his first Hollywood vine in MGM’s TARZAN, THE APE MAN, and played the part for 16 years in 12 films. Elderly John Parker and his young partner Harry Holt are in deepest Africa searching for the legendary “elephant’s graveyard”, which contains a fortune in ivory, but is considered sacred ground by the native tribes. Parker’s daughter Jane shows up, a spirited girl who’s no ball of fluff, but can hold her own. When Jane insists on accompanying the men on their journey, Parker scoffs, but Harry signs off because of course he’s immediately smitten with her.The jungle trek is fraught with perils, like a dangerous river crossing filled with hungry, hungry hippos and killer crocs. As they make their way through the treacherous territory, the explorers hear a strange cry, and soon come across Tarzan, a white man swinging in the trees with his ape friends! The jungle man swoops down and snatches Jane, taking her to his treetop abode. There she meets his pal Cheetah the chimp, and tries to communicate with Tarzan in the often imitated “Jane, Tarzan” scene (and no, they don’t say “Me Tarzan, you Jane” – just like Bogie never said “Play it again, Sam” in CASABLANCA, it didn’t happen!). Tarzan goes foraging for some food, having an impressive battle with a pair of lions over a wildebeest’s bloody carcass, and while he’s away Parker and Holt find Jane in the treetops. The hot-headed Holt shoots an ape that could be Tarzan’s mom (not being fluent in ape language, I’m not sure), and Jane rejoins the safari. Tarzan, angered by this ape’s death, follows, and starts picking off native guides. Holt fires a shot that grazes the jungle man’s head, and Jane is brought to him by the apes. Nursing him back to health, Jane finds she’s missed the simple jungle lifestyle, and after a flirtatious swim, Tarzan and Jane wind up doing the Jungle Boogie – and I’m not talking about dancing! 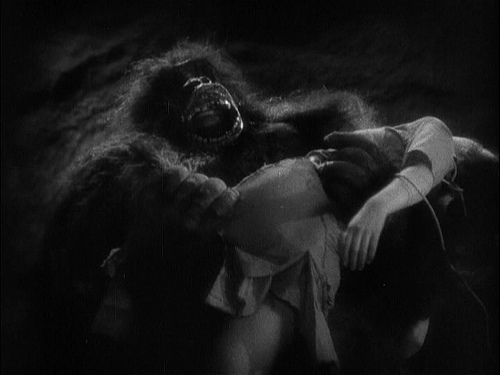 Jane bids Tarzan a tearful goodbye and rejoins her people, who then get captured by a tribe of pygmy warriors and thrown in a pit with a killer gorilla! Good ol’ Cheetah alerts Tarzan, who comes to the rescue with his elephant pals and makes the save! A wounded elephant leads them to the hidden graveyard and passes away, as does a wounded Parker. Jane decides her heart is in the jungle, and stays with Tarzan and her new ape family. Irish actress Maureen O’Sullivan plays the plucky Jane, a role she’d repeat five more times. She and Weissmuller make a perfect match, her feminine beauty complimenting Johnny’s masculine brawn. Britain’s C. Aubrey Smith is her father, and at times the rapid-fire delivery popular in the day makes their accents as thick and impenetrable as London fog! Neil Hamilton (BATMAN’s Commissioner Gordon) is good as Holt, though his character isn’t really very likeable. Cheetah is played by a chimp named Jiggs, and the little guy steals every scene he’s in! And that’s stuntman Ray “Crash” Corrigan in his familiar gorilla suit terrorizing Maureen and company in the pygmy pit scene. Footage shot in Africa for director W.S. 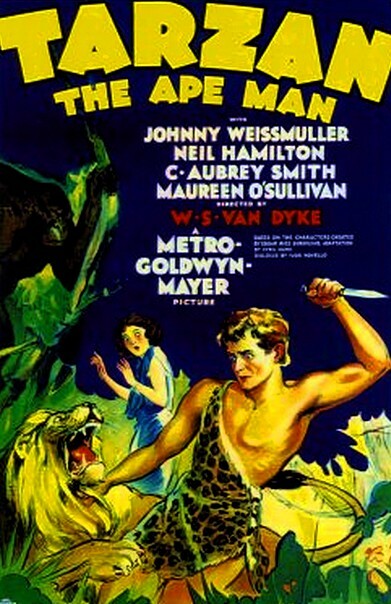 “Woody” Van Dyke’s previous jungle epic TRADER HORN (1931) was incorporated into this film. Cyril Hume wrote the screenplay, with additional dialog by famed thespian Ivor Novello – I’m assuming he wasn’t brought in to freshen up Tarzan’s dialog! The special effects are as primitive as the natives, but that won’t stop you from enjoying this fun, fast-paced adventure film. TARZAN, THE APE MAN is as entertaining to watch today as it was 86 years ago, despite everyone’s familiarity with the character and plot. It’s one of those films where I can truly say, “They just don’t make ’em like that anymore” and mean it! I remember the first time I watched this film…with raised eyebrows. This was before I was familiar with pre-code films. Plenty of Pre-Code moments here!